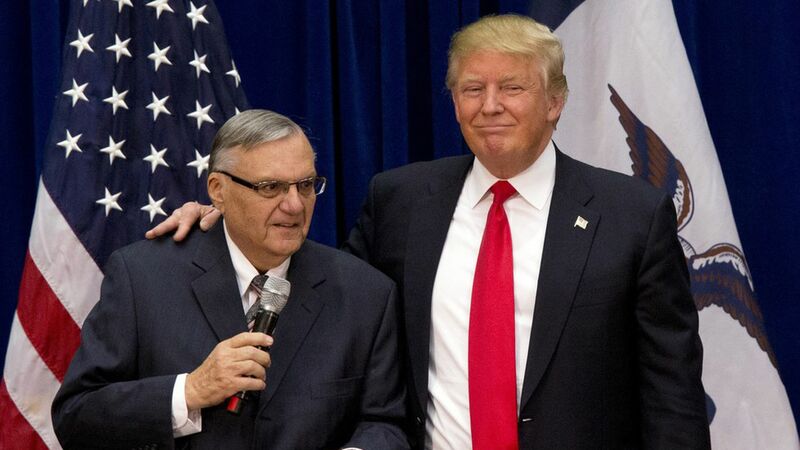 Then-presidential candidate Donald Trump with Arizona Sheriff Joe Arpaio (Mary Altaffer / AP). President Trump told Fox News Sunday that he is "seriously considering a pardon" for Joe Arpaio, the former Arizona sheriff who was recently charged with contempt of court for refusing to obey a federal judge's order to stop traffic officers from racially profiling suspected undocumented immigrants. "He has done a lot in the fight against illegal immigration. He's a great American patriot and I hate to see what has happened to him," said Trump. Background: 85-year-old Arpaio, nicknamed "America's toughest sheriff", received national attention for his aggressive treatment of inmates, including "forcing inmates to wear pink underwear and housing them in desert tent camps where temperatures often climbed well past 100 degrees Fahrenheit," per Fox News. Arpaio endorsed Trump in January 2016, and later handled security for some of the then-candidate's rallies. Arpaio's reaction to the news: The ex-sheriff said he'd accept Trump's pardon, "because I am 100 percent not guilty," but added that he would never ask for a pardon if "it causes heat... I don't want to do anything that would hurt the president." Timing: Arpaio is set to be sentenced on October 5 and could face up to six months in jail. However, some attorneys have expressed doubt that he'll receive any jail time, due to his age and his clean record with no prior convictions.